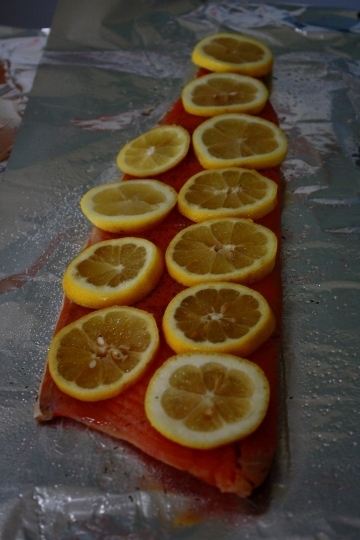 We’ve had a side of salmon in our freezer for a while— I finally poached it in the oven, wrapped in foil, and it was fabulous. Take 2 large sheets of foil folded at the long seem. Lay a third sheet over the seem. Spray it with cooking spray and lay your side of fish skin side down. Pat the fish dry with paper towels. Salt both sides of the fish, sprinkle it with 2 tablespoons of cider vinegar, and dill. Place sliced lemons over the fish. Crimp the foil tightly and place directly on the middle oven rack. Cook until the thermometer registers 135-140 degrees (about 45-60 minutes). To test just poke right through the foil. I started at 45 minutes and it was perfect. Open the foil, discard the lemons and wipe away any gelled liquid. Transfer to a platter or let it cool for half an hour and then refrigerate (up to 2 days). 2 Responses to "Poached Salmon"
The salmon was excellent!! I will definitely have to try this recipe! I’m so glad you were here to try it for me! !